I started to realize that getting to Russia from here was too easy to let the opportunity pass, and I got the necessary documents. The travel agency provided an “invitation”. So I was invited without knowing anybody in Russia. Well, they knew me, or they knew all they wanted to know about me, and that was of course that I have money. The invitation was slightly under 70€, thanks more to the strong euro than to the Russian hospitality. The embassy sold me a visa, I left my id there and was told to wait until Wednesday. 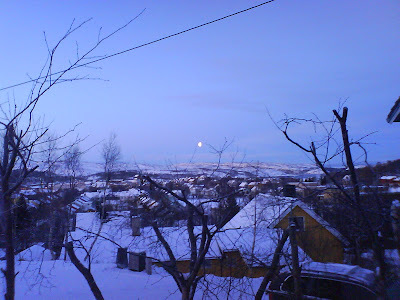 So I had five more days in the quiet little town of Kirkenes, which I spent writing and learning Russian. Yes, I got hold of a penguin complete course for beginners, which was pretty good because it had the right pace of repetition. Isn´t it amazing that I could just walk in the community library and issue a card? I found so. All free of charge, no strings attached. So I picked up some literature too, to improve my not so vivid English you know from this blog. Actually, I picked Virginia Woolf, Henry Miller and James Joyce, so you know what you can expect here, language-wise. The library also offered internet free of charge, and I finally got my blog up to date (even a little bit ahead of me, since the Ullyses copy still resides on the library shelf (it has on own shelf) as I write. I write this account in the local cinema by the way, a metropolitan-style big theater with comfy red chairs with cup holders, popcorn, cola, a well-paid employee, and a 50.000€ surround sound system. You just can´t believe it! We are talking about a 3.500 people town in a 10.000 people community here, and they have a (state owned, as you already guessed) movie theater that easily surpassed the standards in Berlin, Paris, London. This reminds me of another nice anecdote about Norway. When Michael Moore shot his documentary “Sicko“, he also produced some footage on Norway, but did not dare to include it in his film because it was just too unbelievable! (if you don´t believe me, go check it out on YouTube). The Norwegians get a full year paid pregnancy leave, everything is provided for, it has the strongest social security system, in short it is the world´s wealthiest country, first on the WHO-list, where the US has a lousy 66th place. So here I sit in this incredible cinema complex, which includes a small stage and bowling lanes as well, and two brand new apple computers (one of which I am staring at as I write). I met the employee and convinced him of the Cause, that is, of Couch-surfing and I stayed in his really nice apartment. To make myself popular, I said “I am the best pet you ever gonna get”. My novel grew as well. I write on paper, with a pen (a lengthy stick with blue or black ink flowing out of it´s tip by an ingenious process which makes use of capillary forces that you hold between your index finger and thumb and let travel over a sheet of paper in a suitable angle and towards undiscovered territory of your mind). I am so grateful I can do this right now, and I hope the result of my scribbling will rejoice – you, yes you, dear reader. On a few nights we went out to a bar. There are four bars in Kirkenes, and they are frequented by the locals, who enjoy each other´s company. It was what I expected here in the North. I remember accidentally putting that black ball in the neighboring hole at the end of a billiard game with Thomas (the new friend I made in the cinema), thereby letting him win and saving my honor. Thomas could also hook me up with a ticket for the new James Bond movie which they played, so I will go in as some kind of special guest tonight, which will make me feel like Bond himself, the exceptional One, the guy with a big heart, the guy above the law. I will write a review on the movie, and tell you whether or not it gave me the Quantum of Solace it declares in it´s title. ← Tromsø #3. On the Big Truck.